It's not often that we get a video that goes through the entire build process for a Made with Magic hack. But here it is. Estefannie was kind enough to document her efforts and package it in this highly entertaining YouTube offering. 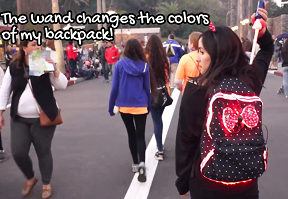 You gotta watch this, even if you aren't in the market for a backpack hack! 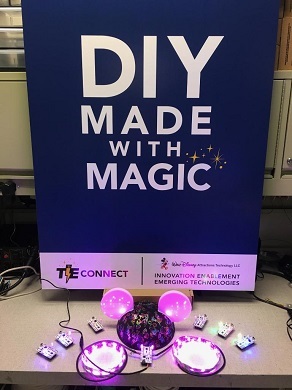 When you do watch the video, you'll learn how she started with a DIYMwM board, a Minnie Mouse bow from a headband, some 12V LED strips and a backpack and then put them all together to come up with her very own Made with Magic enhanced Minne Mouse backpack. Then she gives it the litmus test by taking it over to Hollywood Studios and letting the Fantasmic show have it's way with it. Does just fine, thank you. Good stuff. Watch it once for details about the build. Then watch it again for tips on how to perfect the "blind, over the shoulder Wand click". She nails both. This is how the brave roll. Soldering on the kitchen counter top. Too daring for the likes of me. But then, I suffer from the too-much-coffee, shaky hands syndrome, poor eyesight and advanced age and .... Ah, to be young again! The DIYMwM kit she used in this hack is a relatively new item that's become available at (some?) trade shows that Disney Tech folks attend. If you happen to be at such a trade show, be sure to stop by their booth and see if you get lucky. Looks like an interesting and very convenient starting point for all sorts of MWM hacks. I hope to have more info on this little gem in the not-too-distant future. Stay tuned.